Welcome to Katfrog's Corner: Pirates and LendInk and Lies, Oh, My!! Pirates and LendInk and Lies, Oh, My!! Pirates and piracy periodically dominate the headlines, as the government attempts to pass new laws supposedly to protect the consumer, as the RIAA takes a teenager with clueless parents to court over alleged file sharing for outrageously large amounts of money, or most recently as a bunch of idiots decide a legitimate business is secretly a pirate site. Last week, someone in the publishing industry noticed a website called LendInk.com. This little business venture hooked up people willing to lend out their e-books with people who wanted to borrow e-books. Started by a disabled vet, Dale Porter, LendInk only handled the initial exchange, sending both parties to the appropriate vendor - either Amazon or Barnes and Noble - to do the actual lending of the e-book. It seems that the notion that a person can lend an e-book to another person, in a manner similar to the public library lending a book to a patron, is too radical, too new, and too close to piracy for a lot of authors out there. What began as a misunderstanding on one person's part turned into several cease and desist notices to the website host and several lawsuits threats. By August 8th, the website disappeared from the cloud. Now, of course, comes the backlash from the rest of the world. Indie authors who support LendInk cry foul at those who brought the website down, since people who borrow books tend to buy the ones that they like. Readers wanting to try out new authors and authors trying to attract new readers - both groups lost out here. But as people focus on this event, I think we need to step back and take a good look at Internet piracy. First, let's use some common sense. Some people will steal creative works (regardless of form factor), no matter what. No law will stop them, nor will threat of prosecution. It's a fact of life. But the vast majority of people will pay money for creative works, be it books, movies, music, or art. The item needs a reasonable price point. The buyer has the right to move the purchase from one digital device to another without hassle. The buyer can lend or give the item to a friend without jumping through hoops. The distributor needs to treat the buyer with respect, and not assume the person is a thief (see the image below). There's a story among game developers about a man who purposefully did not stop pirates from getting free copies of his games. Why? Because the pirates wrote reviews and discussed the games that they liked online, generating more than enough revenue for the man to balance out what was lost to the pirates. Neil Gaiman released his book, American Gods, online for free back in 2008 with no DRM. All of his print book sales went up. All. Of. Them. In 2009, Wil Wheaton published a DRM-free pdf of his book, Sunken Treasure, on Amazon for $5. Not only did sales of this electronic book explode, but the print version also began to sell again, as well as some of his other books. There are more stories out there of people who reject DRM and trust people to be nice and who made money doing so; there is even a grassroots movement called Defective by Design that aims to rid the world of DRM. 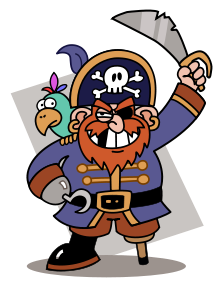 So why are we so worried about pirates and piracy that a group of misanthropes shut down a legitimate business because of a supposed piratical threat? 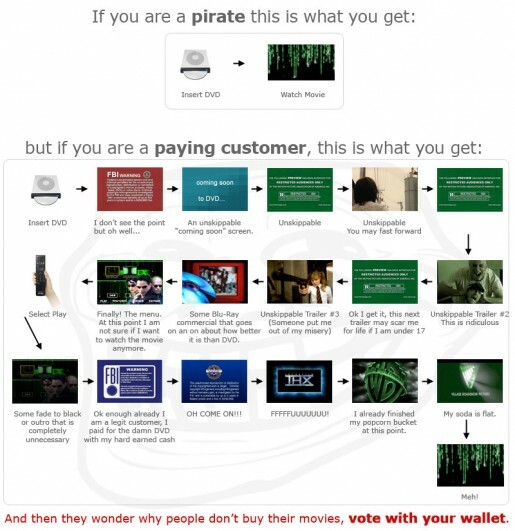 Especially since pirates actually help sales and therefore the bottom line?